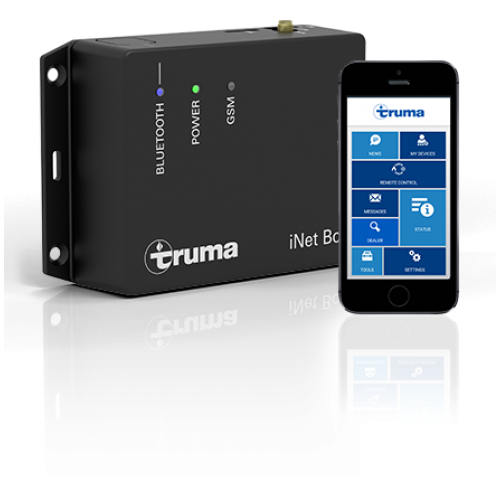 The Truma iNet Box is a central control unit that networks the Truma appliances in your caravan or motorhome. Together with your Truma appliances and the Truma App it forms the Truma iNet System. With the iNet Box, you can control your Combi heater and/or a Truma air conditioner remotely from a smartphone or tablet and check your gas supply with the LevelControl. All you need is the free Truma App. For example, the smart interface enables you to control and monitor the room temperature in your caravan or motor home. Control Truma heaters and air conditioning systems with the App and check your gas supply: It's easy with the Truma iNet Box. To enjoy the benefits of automatic climate control for the Truma Combi heater and air conditioner, you need the CP plus iNet ready control panel. The Truma iNet System received the European Innovation Award in 2016. Control everything at the push of a button: Appliances are controlled via SMS, or Bluetooth if they are within range. A mini-SIM card with its own number is required for smartphone communication (not included). Truma engineers are continuously developing the Truma iNet System and the Truma appliances so that you will be able to use even more practical functions in the future.